We offer Precision Dicing of small parts with tolerances as tight as 5 microns. Although we specialize in glass, we also dice quartz, ceramics, and other hard nonferrous materials. Our State of the Art machinery cuts multiple angles and depths with unparalled precision. We offer the ideal process for cutting exotic and sometimes expensive materials. The thin kerf design means less waste and less excess needed than other cutting methods. As there is no heat and/or wax involved, your parts come out clean and scratch free. 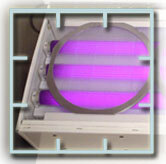 We offer inspection, cleaning, and packing in a Class 100,000 Clean Room environment. 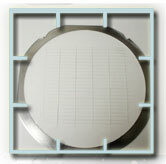 The Dicing process is restricted to a 1/2" thickness and a 12"x 12" length and width maximum.